Swim diapers are now required by most public pools (and they are a good idea in any pool). Designed to contain messes, reusable swim diapers are an important way to keep bacteria out of swimming pools - preventing outbreaks of waterborne intestinal diseases. 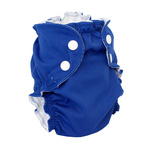 Don't add anything to your cloth swim diaper, it is designed to hold in messes but not urine. Why? Urine is sterile and an absorbent diaper will absorb more pool water than anything else.